In the past few years we have heard a lot about the development and deployment of stealth aircraft, piloted and unmanned. They have been very effective in recent military actions. So, what IS stealth? The dictionary describes stealth as: action to avoid detection: the action of doing something slowly, quietly, and covertly, in order to avoid detection. MILITARY: almost undetectable by radar: used to describe aircraft whose design incorporates technology and materials that minimize the likelihood of detection by enemy radar. The word stealth was first found in military accounts as far back as the 13th century, so it is nothing new! Initially it involved disguise and camouflage to trick the enemies’ vision. And, by covering the hoofs of horses with cloth, sounds were minimize. Grease on the joints and layers of metal armor that covered knights and their steeds also subdued the “clanking” sound when they were approaching the enemy. Native Americans also did the same when on a hunt or in attacks on enemies. The wild west cowboys also copied these methods. Military snipers and special forces personnel have perfected the skill. Early last century when aircraft were first used in combat, noise was a great factor. In order to achieve the maximum from the relatively low power engines, the exhaust system used no muffler; exhaust and noise were vented straight out or downward. So, the smoke and loud noise preceded the plane, warning the enemy far in advance of attack, allowing them to seek shelter. In WWII, a simple design change of porting the exhaust to the rear vastly improved the “stealth” capability of planes. However, when radar was invented by the British that created another problem for airplanes and ships at sea. They could be “seen”by bouncing an electronic beam off the metal surface. So, even with camouflage and noise suppression, they could still be seen. It was soon realized that, if you placed a radar unit in the nose of a missile, it could “lock on” and destroy a target. So, something had to be done to thwart the radar. The first thing attempted was to improve the engines on planes by increasing the power so that they could out-run missiles. That worked for a while till missiles were improved. After WWII planning was begun to develop a plane that was virtually invisible to radar or other tracking devices. In extreme secrecy the most famous was the SR17 Blackbird, a high altitude totally stealth aircraft. The amazing mark of its success is that no one knew it was in service except the crew that developed it, the ground crews and the pilots, all sworn to secrecy. The Blackbird flew for 20 years and its existence was not announced until AFTER it was retired! 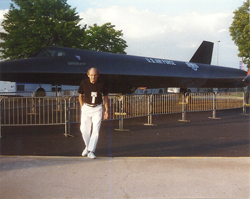 This photo of me standing beside one was taken in 1995 shortly after it was placed on display at the NASA Space Museum in Huntsville, AL. There are a number of stealth-grade craft now in service, and like all in the fleet, the composition, material and technology to make them stealthy are still in the Top Secret category. People have conjectured as to how it is done but the secret is still intact. 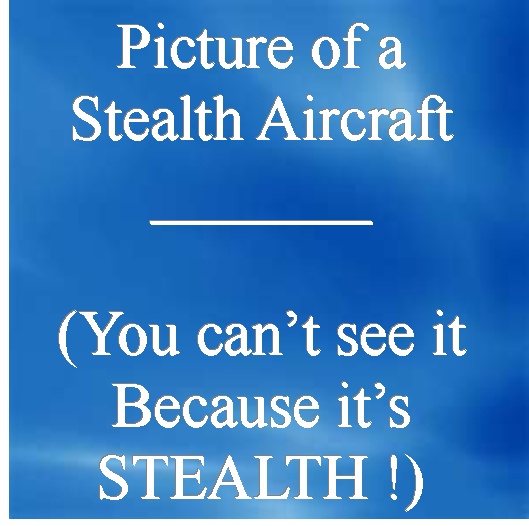 Although stealth technology has “improved” warfare and lessened the casualties (from the pilot’s viewpoint! ), it still doesn’t measure up to my “proposal” of unmanned warfare that I mentioned last December!